This is a SUPERB and highly unusual miniature Winterhalder and Hoffmeier Musical Miniature Grand Sonnerie Bracket Clock. This mini clock has 2 subsidiary dials. 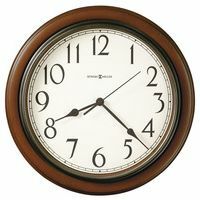 This W & H clock makes the harmonious and LOUDER SOUNDS of a much LARGER ONE! This clock is circa 1890, is signed by W&H and "Sch" (for Schaufhaussen) Germany - European Bracket Clock that was made in Germany. This clock was just completely cleaned and oiled, runs exceptionally well and is of the highest quality. It is (we believe) a mahogany case with fruit wood inlay. Most all of the finish appears original. There is some minor wear to the back top of the case, which can best be described by looking at the pictures -- but does not detract in any way. The back door can perhaps be forced closed, but it appears slightly oversized (or perhaps needs a simple hinge adjustment). 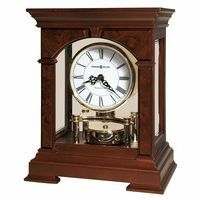 These points are mentioned for complete accuracy, and overall this clock is in great condition. The arched top of the beautiful silvered dial has two subsidiary dials. The First one controls the speed of the clock. The Second one will silence the chime if so desired. The clock plays music on the 2 gongs every 15 minutes, playing progressively more on each quarter hour, until the full chime is played on each hour. 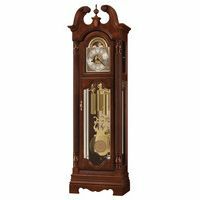 The movement is of excellent quality, being made by the famous and highly regarded Winterhalder and Hoffmeier company, and is in good running and chiming condition.